Morphologic components of the pronephros of Xenopus laevis embryos. (A) The pronephros is made up of three major structural components: The glomus, which is the filtration device; the tubules, which connect to the coelom via three nephrostomes; and the duct, which exits to the cloaca. (B and C) Immunohistochemical staining with the monoclonal antibodies 3G8 and 4A6 allows detection of the tubules and duct, respectively (Photograph courtesy of R. Collins) (9). (D) In situ analysis with the WT-1 marker identifies glomus tissue (photograph courtesy of C. Haldin). (E) Cryostat section of a WT-1 in situ–stained embryo shows the glomus projecting into the coelom. (F and G) In situ analysis with a β4a-tubulin probe decorates the ciliated nephrostomes (Chen and Jones, unpublished observations, 2004). Manipulative techniques in Xenopus embryos. (A) Animal caps can be dissected from blastula-stage embryos with eyebrow hair knives. The addition of activin and retinoic acid at appropriate concentrations instructs the formation of pronephric tissues at high frequency. 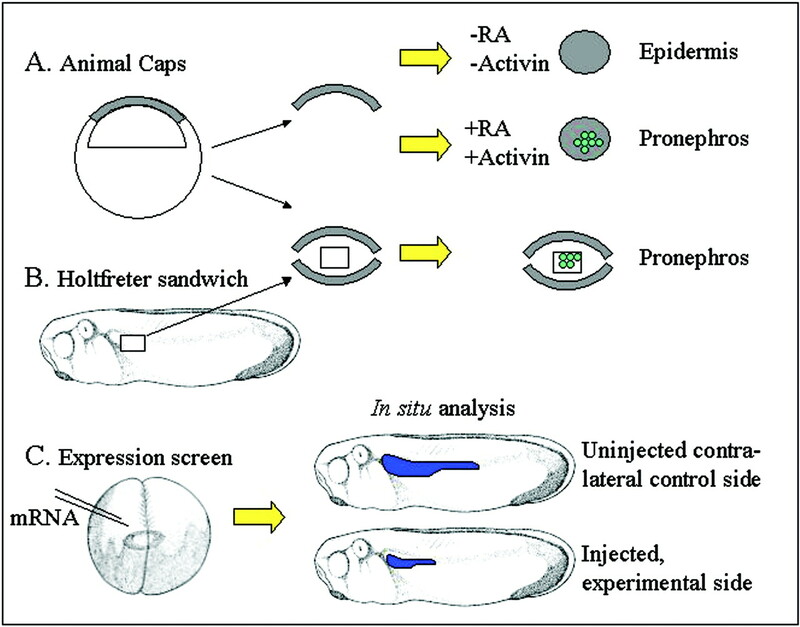 (B) Animal caps can be used as inert chambers to culture dissected pronephric primordia in specification assays (19,23). (C) The two-cell embryo can be injected with mRNA transcribed in vitro from pools of cDNA clones to identify genes with a functional role in pronephros development (24). The injected side is co-labeled with a lineage label (GFP or β-galactosidase), which allows the identification of the experimental side of the embryo versus the contralateral control. The embryos then are analyzed by in situ hybridization for genes that mark early pronephric territories, e.g., Xlim-1 (blue). Differences in the experimental versus the control side of the embryo indicate a role for the injected mRNA in pronephric development. Early cleavage divisions in Xenopus divide the embryo into regions that are fated to become specific structures. At the eight-cell stage, the ventral vegetal cells are fated to contribute to the pronephros. At the 32-cell stages from the ventral C tier, C2 and C3 contribute to this tissue. Microinjection of mRNA into individual blastomeres therefore can be used to deliver specific gene products to the developing pronephros. 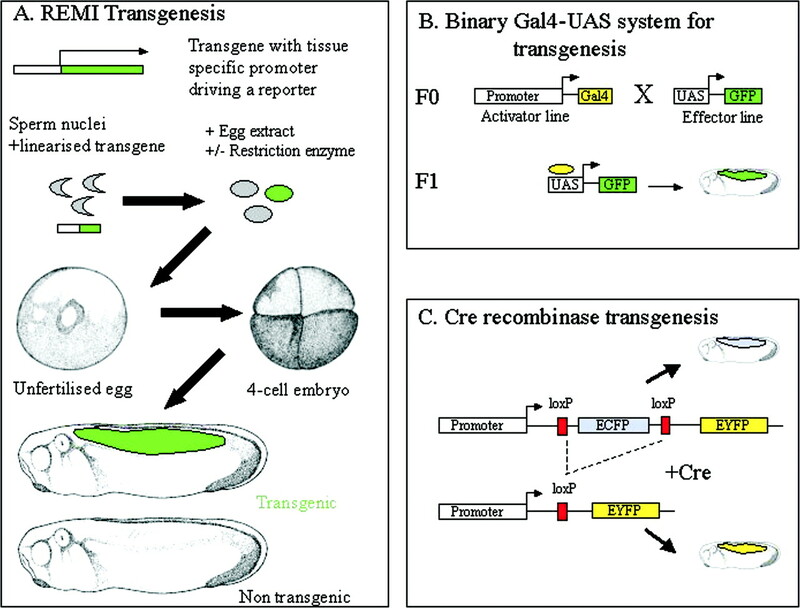 Transgenic techniques in Xenopus embryos. (A) Restriction enzyme mediated incorporation transgenesis has been used successfully in X. laevis and X. tropicalis to generate transgenic embryos and frog lines (31–35). (B) The binary Gal4-UAS system has been adapted for use in the frog to allow tissue-specific expression of the transgene (39). (C) Cre recombinase transgenics also allow tissue-specific transgene expression (42). Colored areas in tadpoles indicate regions of tissue-specific gene expression, in this case illustrating fluorescence reporter gene expression in the somites (muscle blocks). ECFP, enhanced cyan fluorescent protein; EYFP, enhanced yellow fluorescent protein. Which Molecular Signals Direct Pronephric Induction and Patterning?